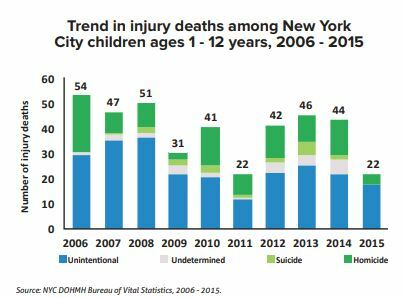 Citywide, between 2006 and 2015, an average rate of 1.7 children out of 100,000 died from unintentional injury. However while looking deeper into the data, disparities appear. The study found that 3 to 4 year old black boys living in very high poverty areas are the most at risk of dying of unintentional injuries while middle class Asian girls between 5 and 9 year old are the less at risk of dying from unintentional injuries. When it comes to homicides, 1 to 2 year old black boys living in very high poverty areas are the most at risk of dying while upper and middle class white girls between 10 and 12 year old have the less risk of being victim of a homicide. While comparing homicides and suicides with specific causes of unintentional injury deaths between 2010 and 2015, homicide is the most common cause of children injury deaths followed by car accidents and fire related injuries. 2015 was different from the other years, homicides were the third cause of injury deaths, motor vehicle accidents the second and fire related the first. Fire related injury deaths were at their highest in 2015 because a single fire resulted in several children fatalities.